Meet the Cinderfellas of the NCAA! 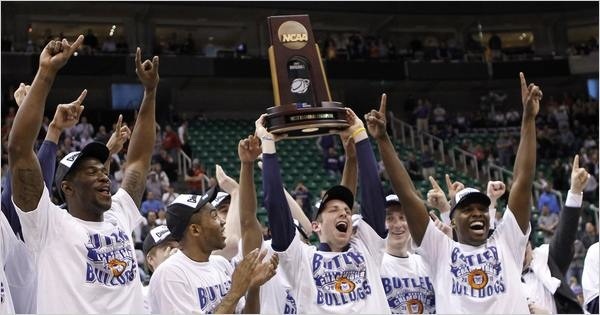 ESPN reports that only 881, out of more than 5.9 million Tournament Challenge brackets, picked the Butler-Connecticut national title game match-up. Mista Oh! confesses that, for the 2011 college hoops season, he hasn’t been the March Madness fanatic he’s been in years past. But he is still pretty stoked over the improbable unpredictability of the match-ups in NCAA March Madness Championship Basketball. He ain’t takin’ credit for being one of the few to have predicted correctly from the outset, but as things began to heat up, Mista Oh! did post his UConn/Butler bracket picks a couple of days ago. Read on for excellent coverage of Butler and UConn: A Tale of Two Cinderellas by Eamonn Brennan, posting on ESPN. Previous Entry Uncool at any speed? Yanks deny cheating!